Nicole by OPI’s Glitz and Glisten is a clear base filled with purple micro glitter. It’s very sparkly and pretty but (to me) almost useless on its own. This was three coats and you still can see my nail. So what’s a girl to do in this situation? Layer of course! I didn’t really put much thought into what polishes would match with this glitter. The only one that I knew would match was Nicole’s The Grape Debate as it came with Glitz and Glisten in a set when I purchased it from the US. True enough, it was the best combination. The purple glitter on the dark purple creme base looks really dazzling, almost like purple stars in the sky! My second favourite has to be the combination with China Glaze Sugar High. In the end, I decided to go for a more subtle look using glitter just at the nail tips. Here is OPI Coney Island Cotton Candy as the sheer milky base; China Glaze Snow Globe as the first layer of glitter at the tips; Nicole Glitz and Glisten as the second layer of glitter; and finally, China Glaze White Cap as the overall wash covering the nail. 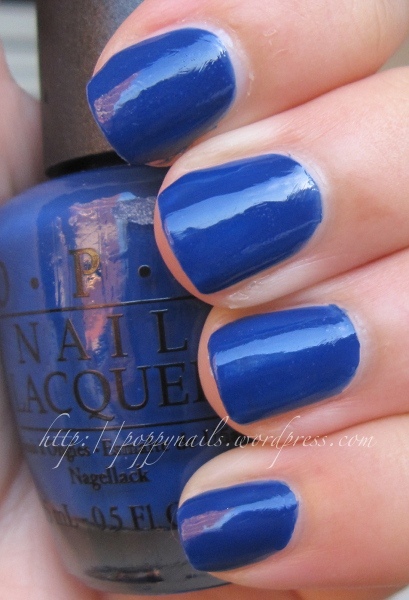 OPI Dating a Royal is a deep bright blue creme from the Mod About Brights collection. It has a semi-jelly texture which makes it incredibly shiny. You can spot the reflection of flats behind me in the second picture. The jelly texture also means that you have to be careful to cover all bald spots. Too light a brush stroke will easily leave you with patches of lighter blue. I recommend three coats to be perfect. One reason why I am so enamoured with this polish is that it’s the colour of one of my favourite rocks the lapis lazuli, which is found mainly in the mines of Afghanistan. 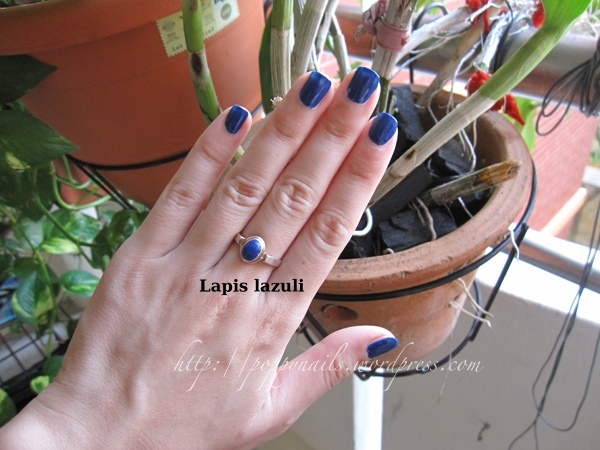 My lapis lazuli ring (pictured above) was bought from Montpellier, France, which sold lots of other nice gemstones as well. If you’re a Vampire Diaries fan, you would also know that Lapis Lazuli was worn by several vampires as protection against the sun. 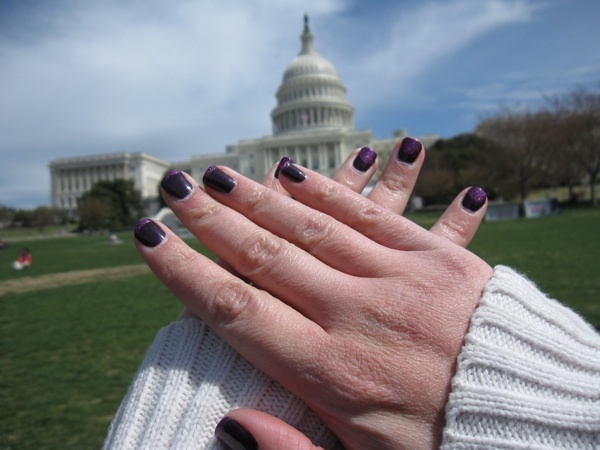 The Grape Debate, from Nicole by OPI’s 2010 Holiday collection, is a dark plum creme. I like it because you can clearly tell it is purple even though it’s a dark shade, unlike one of those many near-black shades that look black most of the time (I’m looking at you, OPI Here Today, Aragorn Tomorrow). I like this shade. I think it looks quite sophisticated and it’s definitely work appropriate. 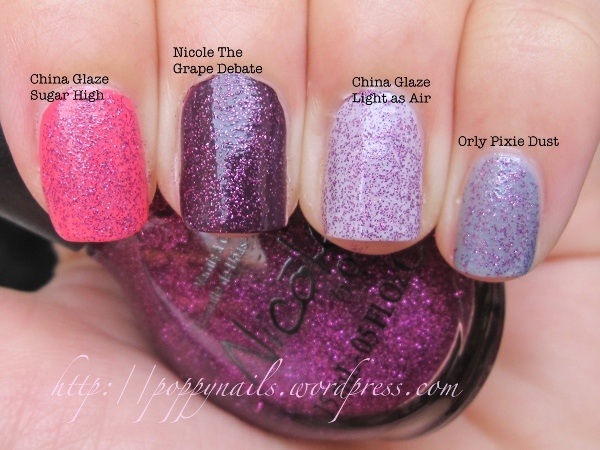 Nicole’s Glitz and Glisten came together with The Grape Debate when I purchased it in the US. The back of the box suggested that we use Glitz and Glisten as a French tip, so we tried that on one hand and it turned out quite well.